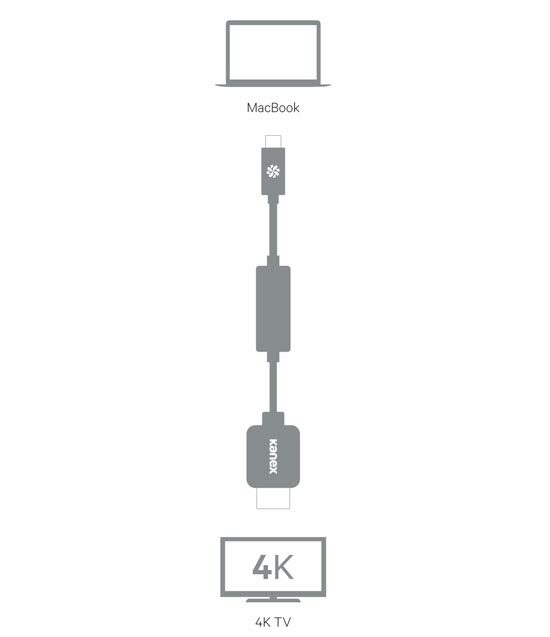 The Kanex USB-C to HDMI Cable lets you expand your new MacBook’s screen onto a 4K HDTV or HD display. View your favorite movies, TV shows and your photo collection in full HD with multichannel digital audio output. Display your files on your HDTV or HD projector. Watch the latest movies and TV shows on Hulu, Netflix, or iTunes. You can even share your favorite photos and videos with your friends and family. Product Dimensions: (W x H x L) 0.89 in. x 0.54 in. x 79.2 in. (W x H x L) 0.89 in. x 0.54 in. x 196.8 in. Product Weight: 3.4 oz. / 0.21 lbs. 11.8 oz. / 0.74 lbs. Packaging Dimensions: (W x H x L) 3.97 in. x 6.06 in. x 1.51 in. (W x H x L) 6.22 in. x 7.75 in. x 1.51 in. Product Weight: 4.7 oz. / 0.30 lbs. 14.2 oz. / 0.89 lbs.